In his State of the State address, Governor Jim Justice proposed the elimination of the personal income tax on Social Security income. Justice’s proposal, S.B 342, would completely exclude Social Security benefits from the state income tax, similar to how the state treats military retirement income. While this is being touted as a “middle class” tax cut, it is really a tax cut for high-income retirees, including millionaires. A better approach would be to limit the tax cut to low- and middle-income West Virginians, and include a tax cut for low-income working families like a refundable state EITC that also has other important benefits. Otherwise, it is not efficient use of resources. 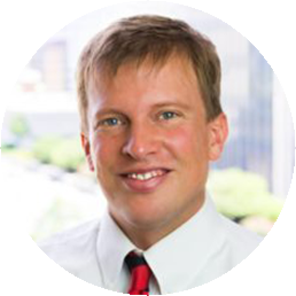 Over the years, there has been a number of bills introduced to eliminate or scale back the amount of income tax applied to Social Security benefits. Last year, the cost to the state from fulling eliminating the tax was estimated to be $92 million, while a partial elimination for those with incomes below $100,000 was estimated to cost the state $34.3 million. 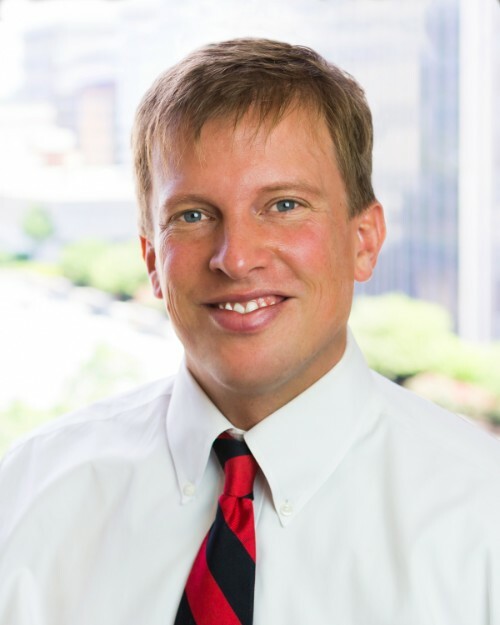 While Governor Justice’s bill does not have a fiscal note, the Department of Revenue (DOR) says the total cost is only $50 million, $42 million less than estimated less year. It is unclear why there is a large discrepancy between the two estimates, other than the DOR stating that it just now discovered that just “22 percent of social security benefits in West Virginia” are taxed and that only half of those receiving Social Security benefits pay the state income tax. Either way, the distribution of the tax cut would be the same. The fact that so few West Virginians pay income tax on their Social Security benefits should tell us that this is not a middle-class tax cut. As the graph and analysis by the Institute on Taxation and Economic Policy (ITEP) below shows, the average tax change from eliminating the state income tax on Social Security is highest for those that make (on average) $245,000 at $554. Meanwhile, those with incomes between $36,000 and $56,000 (middle 20%) receive on average just a $34 tax cut. If we zero in on those receiving the tax cut – instead of the average tax change for everyone in the income group – those in the middle 20 percent will receive an average tax cut of $161 while those in the next four percent making on average $245,000 receive an average tax cut of $1,879. In other words, the average tax cut for a person with $245,000 in income receiving Social Security benefits would be over 11 times greater than someone with $45,000 in income. One reason for this is that West Virginia already offers an $8,000 decreasing modification per individual over age 65 and for most low- and middle-income West Virginians that rely heavily on Social Security for their income this wipes out most of their state income tax liability. As a result, 64 percent of the tax cut goes to those in the top 20 percent ($91,000 and above), while just 36 percent goes to those with incomes below $91,000. Those with lower incomes will receive virtually no tax savings from eliminating the tax on Social Security. Instead of eliminating the tax on Social Security, policymakers could eliminate the tax for those with incomes below $100,000 (filing jointly) and use the savings to give a bottom-up tax cut to low-income working families that need it the most. West Virginia already has an upside-down tax system where the lowest-income families pay, on average, 9.4 percent of their incomes in state and local taxes while the top 1 percent pay just 7.4 percent. 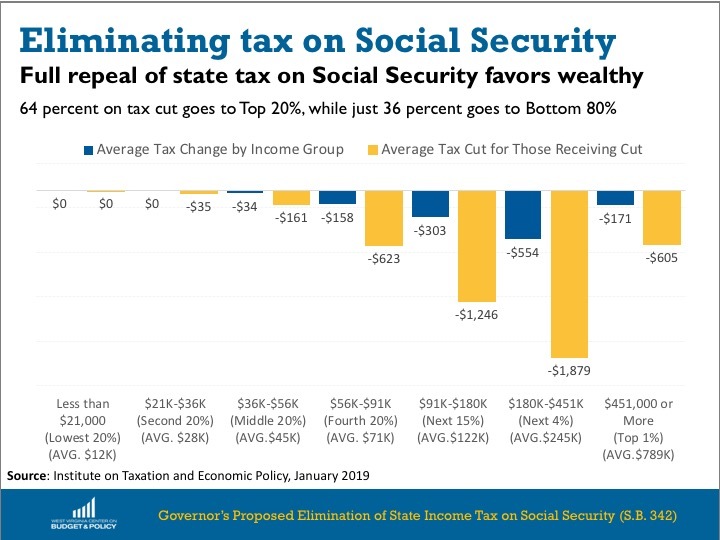 Adding a refundable EITC and limiting the state income tax on Social Security benefits would provide more balance to the governor’s tax cut proposal while still providing a hefty tax cut to those in the middle- and upper-middle class. 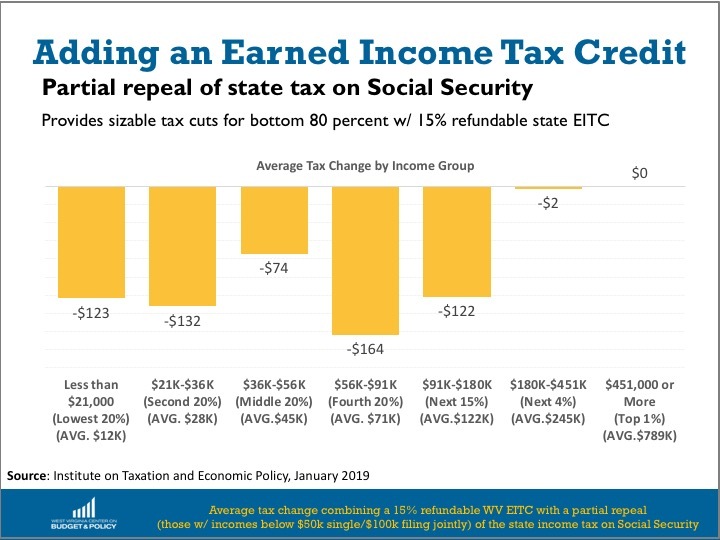 Adding a 15% refundable state EITC to a partial elimination of the tax on Social Security would reduce taxes by $123 on average for the lowest-income West Virginians while also giving upper-middle income people a tax cut of similar size. Adding a refundable Earned Income Tax Credit would not only make our tax system more fair, it would also provide a bridge to the middle class for those workers that can’t make ends meet. Altogether, 29 states and the District of Columbia have state EITCs that piggyback on the success of the federal EITC. A refundable state EITC set at 15 percent of the federal EITC would benefit over 150,000 tax filers in West Virginia by putting an estimated $54.7 million into their pockets so they can meet their basic needs. The EITC has been shown to not only lift people out of poverty, but it also encourages work and can lead to better outcomes for children. Adding a refundable EITC to a partial repeal of the state income tax on Social Security still provides significant tax savings to middle class retirees but also helps ensure that low-income workers also receive a sizable tax cut and gives them a better shot at entering the middle class.